Learning to spot a lie is a crucial skill. It can keep you out of tough situations – and it can keep you away from shady individuals. People who are dishonest and tell lies, often form a habit of this and lie frequently. Criminals are of course generally dishonest people and will often be found telling lies to the people in their life. There are things you can do to get a better idea if someone is really telling the truth, and cross checking any information you can about them can be a good indicator to determine if someone is honest or not. So with that in mind, here are 6 things that could indicate someone is lying to you. This tip sounds weird until you see it in practice. Many people unconsciously cover their mouths or eyes when they’re telling a lie. If you ask a sensitive question, and they need to lie to answer, then they might place their hand over their mouth or rub their eyes as they speak. Subconsciously, the person is trying to shield sensitive parts of their body from the lie. Some people don’t rub their eyes: they’ll just close them or even blink more frequently. It’s a natural habit that many people cannot hide. Watch for it the next time you think someone is lying to you. When you’re telling a lie, the autonomic nervous system kicks into action. That part of your body responds to anxiety. The most noticeable effects are that blood will drain from the surface of your face, your eye, and your extremities. This can cause the person to feel cold or itchy. You may notice their hands start moving or scratching certain parts of the body. They could start wringing or rubbing their hands together. Meanwhile, in the face, this can lead to small signs like licking the lips or scratching the nose and ears. Look for anything someone does in the head or face region when you suspect they’re telling a lie. When someone is asked a lie, their brain panics. It enters a state of anxiety. A natural response to this anxiety is to calm yourself by playing with objects or your own body. After someone is asked a question, they may start to clean objects around them, adjust things in their purse, or perform other actions with their surroundings. It’s an attempt to do something normal to cover up an abnormal activity like lying. This one is something you don’t hear very often. According to Jeffrey Hancock, an associate professor of communication at Cornell University who studies online lying, claims that people who are lying about themselves rarely use the word “I”. Instead, they’ll speak about themselves in the third person, saying things like “This is a girl who loves to swim” or just through out the pronoun altogether, using sentences like “Swimming at the beach today”. Telling a lie spikes anxiety levels, and this causes saliva to fill our mouths (or, depending on your level of anxiety, it could cause the throat to dry out). In any case, people who tell a lie may swallow excessively to try to rid their mouths of this uncomfortable feeling. 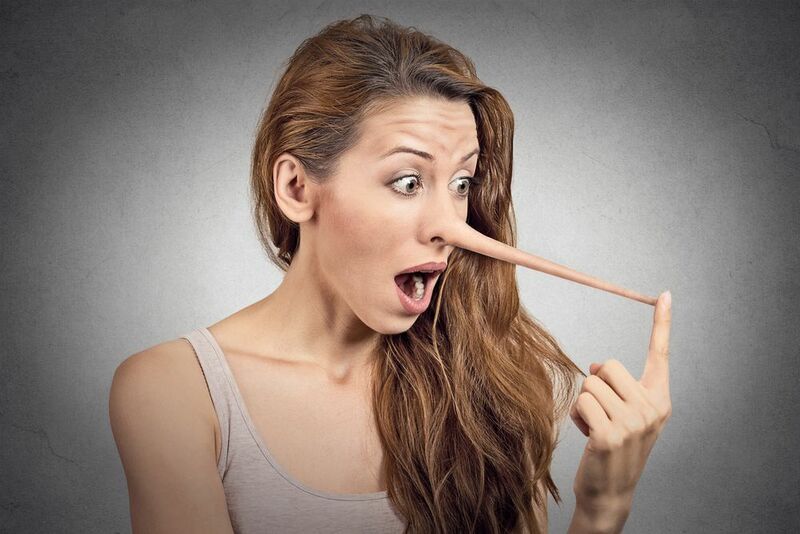 Some experts have also noticed that people clear their throats more frequently when lying. Any action with the throat can indicate someone is lying to you. Someone who is trying to lie may have read a list like this. Understandably, when telling a lie, they’ll start to speak very deliberately and slowly. They’re trying to make sure they don’t scratch their nose, rub their eyes, blink too rapidly, or swallow a lot. Controlling all of these unconscious body motions can be difficult. It requires concentration. If someone appears to be deliberately talking slowly, then they could be trying to hide a lie. Unsure about someone in your life? Want to investigate a neighbor, coworker, or boss? There are all sorts of good reasons to check someone’s criminal record. Many people are unaware that checking someone’s criminal record is a perfectly legal thing to do. Criminal records – and a lot of other sensitive information – is part of someone’s public record. Do you think someone’s lying to you? Perform a fast criminal record check on them today to get the full story they’re not telling you. CheckCriminalRecord.com can help you get started today for free. Which Parts of Your Personal Data Are Considered “Public Record”?